After confirming her relationship with mainland actor Li Chen (李晨) in August 2013, Viann Zhang (張馨予) surprised her Weibo followers a month later with an announcement that she had split with the Saving General Yang <忠烈楊家將> star. Suffering social media backlash for her seemingly careless attitude about her relationship with Li Chen, Viann clarified in a statement that the two drifted apart due to having different values about their relationship. Reports surfaced in mid-September that Viann and Taiwanese actor Wallace Huo (霍建華) hooked up, a claim that intensified when Wallace’s former girlfriend Joe Chen (陳喬恩) dropped hints on her Weibo that someone had cheated on her. Mainland Chinese media outlets contacted some of Viann and Li Chen’s mutual friends from the industry, and their friends suggested that something ambiguous did happen between Viann and Wallace while the two were shooting a drama together last year. 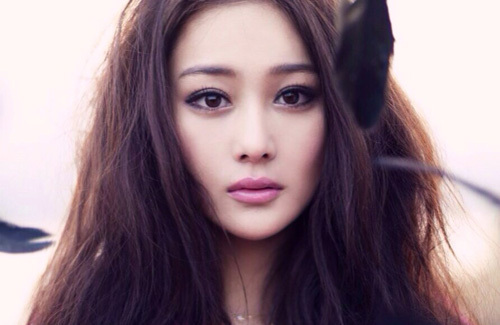 Viann was emotionally caught between the two men, which drove her to initiate her breakup with Li Chen. However, it was reported that Viann’s feelings for Wallace were not the only reason why she chose to end her relationship with Li Chen. According to Li Chen’s close friend, Viann’s reasons for breaking up with the actor was because of dignity. Li Chen believed that the reasons behind Viann’s recent success in the television and film industry were because of his wide connections with many producers. Viann started from the bottom rugs in her early career . Proud of her own achievements, Viann felt that Li Chen was being unfair to her. In addition, Viann often complained that Li Chen was not as invested in the relationship, and she found it increasingly harder to communicate with Li Chen. Mutual friends of the pair confirmed that the couple had indeed broken up, but insisted that they have lingering feelings for each other. A few weeks ago, at producer Yu Zheng’s (于正) birthday party, Li Chen reportedly drowned himself with drinks and cried about Viann. Viann is Ron Ng’s ex-girlfriend. It’s catching up with the ex’s in this piece. Li Chen seems to be the type that rough outside, emotional inside. Btw, watched Viann in Tian lung 2013 and I wont find it’s too weird if men like Li Chen or Wallace Huo fall for her. She really looks like one of friends,except that my friend looks more Eurasian.